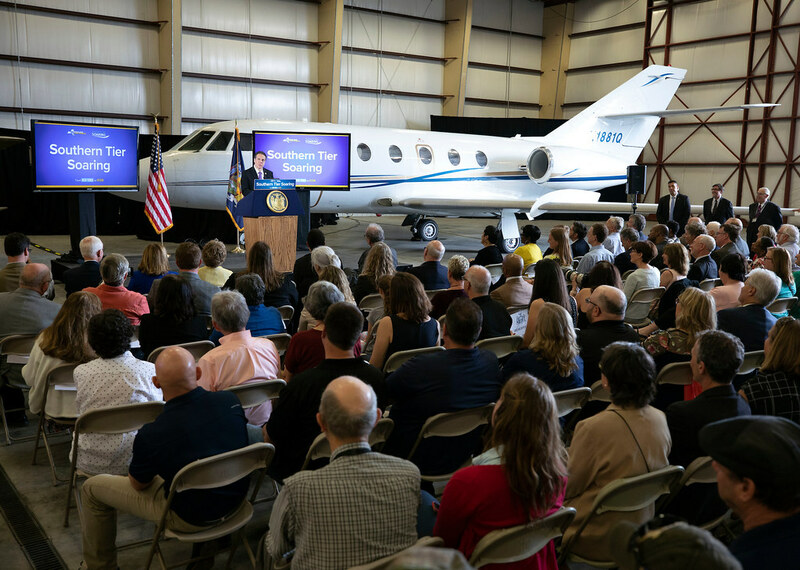 Governor Andrew M. Cuomo today announced a $22 million project to transform the Ithaca Tompkins Regional Airport as part of the Upstate Airport Economic Development and Revitalization Competition. As a separate project, the New York State Department of Transportation will relocate its maintenance facility from its current location on Cayuga Inlet to the Airport, freeing up 7.6 acres of prime waterfront property for development in Ithaca, resulting in new private investment in the city to generate business and tourism opportunities to stimulate economic activity. "The land relocation will deliver prime, waterfront development opportunities to the Ithaca community to attract innovative projects, revitalize the economy and generate growth for generations to come," Governor Cuomo said. "Airports are gateways to our regions, and this project will transform Ithaca Tompkins Airport into a modern, state-of-the-art facility to drive tourism and economic development and help keep the Southern Tier Soaring." The $22 million project to revitalize and expand the Ithaca Tompkins Regional Airport is being supported with $14.2 million in state funding as part of the Upstate Airport Economic Development and Revitalization Competition. The renovation will not only improve long-term economic viability, but it will also improve the passenger experience, increase security and better serve international travelers. The Airport serves three major airlines with more than 650 global connections. In 2016, enplanements were up 15 percent and are expected to continue growing in the future. To accommodate this growth, this project will expand the terminal, which together with the new customs facility, will expand the airport by nearly 50 percent. The expanded terminal will provide more seating, six new gates, three additional passenger bridges, bringing the total number of passenger bridges at the airport to four, and new retail opportunities. A new customs facility will allow international aircraft to fly directly to the airport, which sees more than 22,000 international travelers annually. Currently, travelers have to stop at other airports before arriving in Ithaca in order to clear U.S. customs, however, once the project is completed, it will help to enhance the region's ability to grow globally by eliminating this additional travel barrier. Overall, the modern technology and energy efficiency enhancements provided through this project will better serve today's travelers. Major security enhancements, including updating TSA baggage screening to be compliant with post-9/11 security requirements and adding another line for passenger security screening to alleviate wait times. Reconfiguration of the security checkpoint and relocation of TSA office space as part of a 7,500-square-foot expansion of the passenger hold room. Reconfiguration of airline office space and expansion of baggage screening space as part of a 2,500-square-foot addition on the east side. Baggage security and check-in improvements to streamline the process and improve efficiency. Three new passenger boarding bridges to accommodate jet aircraft and additional service. Addition of 1,700-square-feet of space at the main entrance and an expanded ticket counter to improve passenger circulation and provide more room for ticket lines. Construction of a new 5,000-square-foot Federal Customs Facility. Technology upgrades to include high-speed WiFi, Bluetooth connectivity and additional charging ports and outlets. Food service enhancements, such as expanding a pre-security café and adding 4,000 square feet of space for post-security food concessions. Installation of a separate bus lane and a wind-resistant waiting area for buses, taxis and hotel shuttles. Installation of new plumbing, HVAC, fire protection, mechanical and electrical systems. Installation of a new geothermal water-source heat pump system to reduce natural gas usage for the terminal. Work is expected to be completed in 2019. "Airports are gateways to our regions, and this project will transform Ithaca Tompkins Airport into a modern, state-of-the-art facility to drive tourism and economic development and help keep the Southern Tier Soaring." As part of the redevelopment of the Airport, the County will develop a 53-acre Airport Logistics Park on Ithaca Tompkins Regional Airport property which will feature a new State Department of Transportation maintenance facility. Moving the DOT facility from the city of Ithaca to the Airport will enhance DOT operations and open up 7.6 acres of prime waterfront property for development. Located just south of Cayuga Lake and the popular Ithaca Farmer's Market, the waterfront parcel also borders the Cayuga Waterfront Trail. Ideas for developing the area include multi-use housing, a hotel, expanded public space and hiking trails, restaurant and boat slips, and commercial lofts. The current transportation facility, built in 1956, is aging and inadequate for current operations. The project involves constructing a new maintenance garage with roof-mounted solar panels that will meet LEED standards. The Airport Logistics Park will also include space for Tompkins Consolidated Area Transit offices and other future tenants. DOT Acting Commissioner Paul A. Karas said, "Governor Cuomo's investment in the Ithaca Tompkins Regional Airport will expand the reach of area businesses and universities on a global level, and further spur economic development. The expansion and modernization will also allow for a safer, more efficient passenger experience." Senator Tom O'Mara said, "The regional aviation industry has an enormously positive economic impact across the local economy. Our regional airports create jobs, make us more competitive, and deliver economic growth and other critical opportunities to communities across the Southern Tier and Finger Lakes regions. These smart investments in aviation infrastructure will lead to vital short- and long-term benefits, including in Tompkins County where this transformation of the Ithaca Tompkins Regional Airport and the relocation of the state Department of Transportation will greatly benefit the county and the city in numerous ways." Senator James L. Seward said, "The Ithaca Tompkins Regional Airport is a key component of our local economy. Recent investments have helped boost airport use and continued state support will lead to added growth. When people touch down at ITH we want them to know they have arrived at someplace special. This funding will help convey that impression and send the message that the sky is the limit in Tompkins and Cortland counties and the surrounding region." Senator Pam Helming said, "This critical investment will drive job creation and economic development in the Finger Lakes region. Our lakes, beautiful environment, wineries, and craft breweries draw visitors from across the United States. This state investment will ensure that tourists will have access to all that our region has to offer. The Ithaca and Tompkins County region is a growing business and economic center of upstate New York, with positive job growth exceeding 8% over the past 5 years. Equally important, our local universities and business rely on the airport. Protecting Cayuga Lake is a top priority and moving the DOT facility to the airport will help achieve this objective. I appreciate the efforts of Governor Cuomo and my legislative colleagues in making this project a priority." Co-Chair of the Legislative Aviation Caucus Senator Phil Boyle said, "The economic boon generated from this type of funding access can dramatically change the financial scope of a community. Assisting regional airports with funding resources to improve safety and modernize is a critical step in job growth, business expansion, and a potential tourism boost to regions across the state. I applaud the Governor and the State's DOT on this important grant program and encourage all airports across the state to apply for these crucial jumpstart funds." Assemblywoman Barbara Lifton said, "This is great news for our community. There's no question that this vital investment in our airport will broaden economic and tourism opportunities in our region. In addition, the long-awaited relocation of the NYSDOT facility from Cayuga Lake to the airport will have many positive impacts for Ithaca's waterfront. I was proud to support this funding in Albany, and I want to thank everyone in the city and county governments who have worked so hard to make these ground-breaking projects a reality. I also want to thank the Governor for his continued strong focus on the upstate economy, listening to local stakeholders about the most effective avenues for state investment." Chair of the Assembly Committee on Transportation David F. Gantt said, "As Assembly Transportation Committee Chair I am pleased to see that our state's airports are eligible for funding to help make them safer, more competitive, and more effective in general for travelers, for the communities where they are located and for our State's economy. The revitalization project at the Ithaca Tompkins Regional Airport is a perfect example of how smart investment can transform our Upstate airports." Co-Chair of the Legislative Aviation Caucus Assemblymember Donna Lupardo said, "The Upstate Airport Economic Development initiative recognizes that New York's airports are important economic drivers in their communities. In order to stay competitive, they need regular upgrades to improve safety and modernize their operations. This announcement for Ithaca Tompkins Regional Airport will see additional benefits for the Ithaca community by freeing up prime waterfront real estate that will attract further development. As Co-Chair of the Legislative Aviation Caucus, I'd like to thank the Governor for his commitment to the state's airports and look forward to building on this commitment." Ithaca Mayor Svante Myrick said, "This project will create a once in a generation opportunity to put Ithacans on the waterfront. Alongside the airport upgrade - which will make it easier for Ithacans to connect to the wider world - this announcement will make Ithaca an even better place to live." Martha Robertson, Chair, Tompkins County Legislature said, "Today we are celebrating what we can accomplish when local and state governments work together, when the public and private sectors work together, and when problem-solvers and visionaries work together. Thanks to the Governor's support, we'll be creating a vibrant, mixed-use waterfront district, creating space for a 21st century DOT facility, and expanding the Ithaca Tompkins Regional Airport to give us the innovative, world-class airport we need." Today's announcement complements "Southern Tier Soaring", the region's comprehensive blueprint to generate robust economic growth and community development. The State has already invested more than $4.6 billion in the region since 2012 to lay for groundwork for the plan - attracting a talented workforce, growing business and driving innovation. Today, unemployment is down to the lowest levels since before the Great Recession; personal and corporate income taxes are down; and businesses are choosing places like Binghamton, Johnson City and Corning as a destination in which to grow and invest. Now, the region is accelerating Southern Tier Soaring with a $500 million State investment through the Upstate Revitalization Initiative, announced by Governor Cuomo in December 2015. The State's $500 million investment will incentivize private business to invest well over $2.5 billion - and the region's plan, as submitted, projects up to 10,200 new jobs. More information is available here.